"This is a good, old-fashioned sweet potato pie kissed with nutmeg, vanilla, and lemon juice. It's a twenty-five year old recipe that I think is really good." Combine the potatoes and melted butter in a mixing bowl. Stir the eggs, sugar, milk, nutmeg, vanilla, lemon juice, and light whipping cream into the potato mixture. Beat until well blended and smooth; pour into the pie shell. Bake in preheated oven for 50 to 60 minutes, until toothpick inserted in center comes out clean. Serve warm or cold. 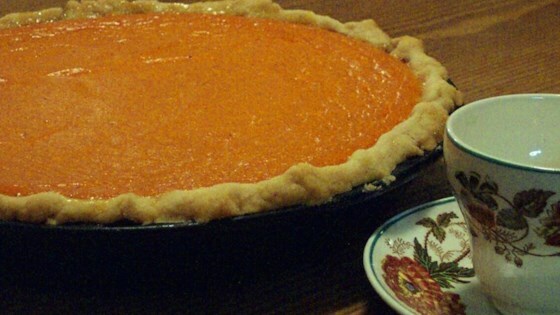 hands down, the best sweet potato pie recipe I have ever tried...and I have tried many! Perfect texture and not too sweet. My family loves this recipe so much, that it has become a "must have" during the holiday season. very yummy, but it makes 2 pies, so make sure you have 2 pie crusts!